A player named KissMyCores is starting to get a reputation for his custom built core sets. Apparently his custom cores work well even on large heroless players that aren’t nerfed. As far as we know, or anyone we know is aware of, this hit on a 263B player has set a new high bar for largest heroless player burned. We’ve all seen the new research trees and the new boosts hidden half a dozen $99.99 gold packs down in the trees, so burning players this large does take some know-how with crafting cores and doing some math. There’s often a pencil and paper/calculator involved, and/or spreadsheets, based on a couple of guys I know. KissMyCores has gotten to the point that tweaks all his sets on the fly to maximize their destructive power, even from hit to hit. This hit came about after RT THE HATED (RT, from here on. Sounds like I’m yelling if I type his whole name out) was talking up that he had never been burnt, and many had tried and they all failed. In any event, KissMyCores and company decided to give it a try. The very first hit burnt him. 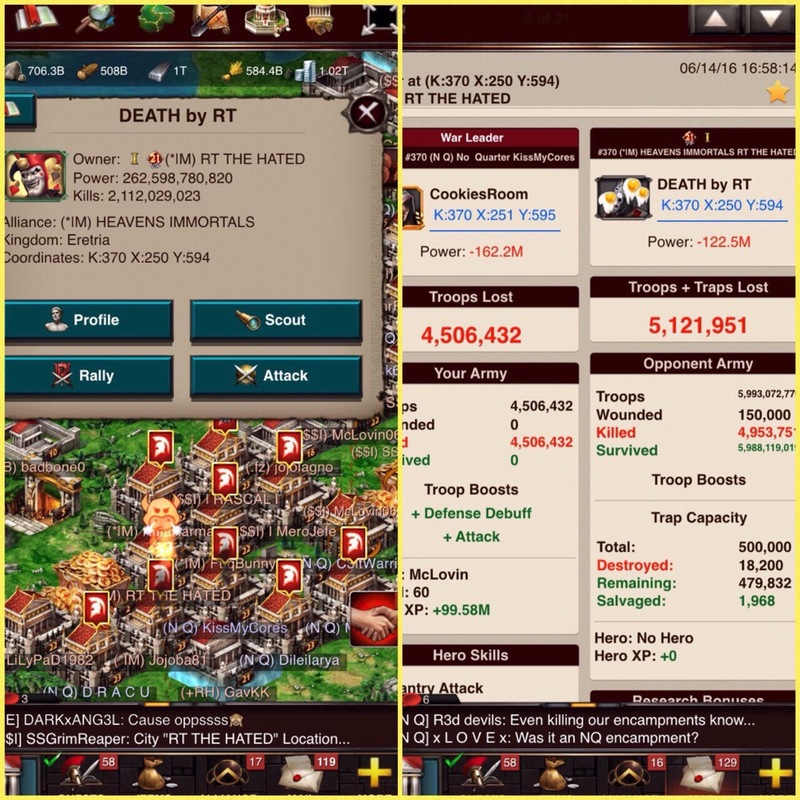 Note that RT was not reinforced for any of these hits, nor did he boost for any of them. After the initial hit, RT removed some of the meat he was carrying and trained more T4 troops in an attempt to prevent burning a second time. 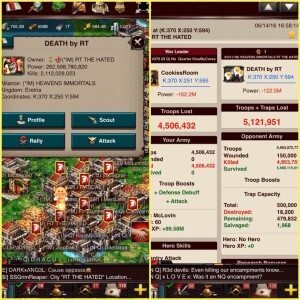 The next hit failed to burn him (no screenshot), and it was much less close (difference of ~500k troops). KissMyCores switched out some gems and a few pieces on some of the custom cores and was able to burn RT for a second time, though this time just barely. 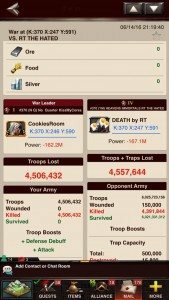 There was about a 50k difference in losses, so RT removing meat and retraining did made a difference. Here is the second hit that burned him (not second overall). As you can see, much closer. Losing heroes and how players react to doing so is becoming an ever growing part of the game. A popular saying goes, “If you don’t lose your hero, you aren’t trying hard enough.” These types of hits on massive players prove that no matter how big you are, there are players out there somewhere that are willing to take a chance and hit you. These hits also show us that the margin on core stats needed to burn heroless players is currently quite small, with a few gems or pieces here and there being the difference in a burn or a massive defeat. Once Hall of War Lv.23 is released it should upset the current status quo, but by how much remains to be seen. KissMyCores would like to thank (b&h )Xiownthispla of K571 for helping him learn how to craft better custom core suits, and how to better change them on the fly. Have you burned bigger, or seen someone burn bigger? 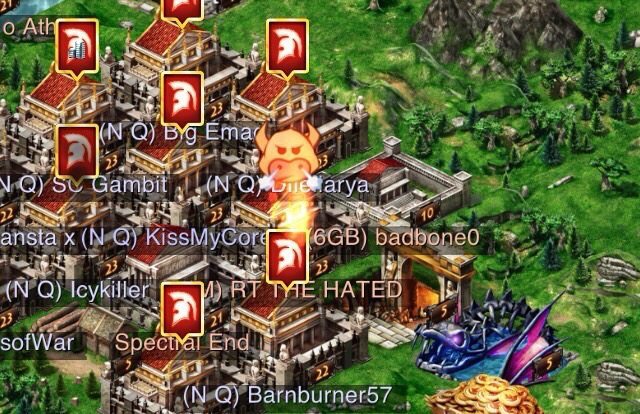 Please send screenshots and details (the more, the better) in to MHY@insidegameofwar.com or Lubears@insidegameofwar.com. Quite compherensive. i thinks its been 2 or 3 years im quitting. I played at K8 back then. And the only ancient is K2. That time K8 is the biggest K, and KvK is not introduce yet. K8 with ToP and all betrayal drama was really intense. Im just petty crime spender, 1 months to get 200K power is already painfull. Those ToP, TRO, HoW etc mostly mafia spender. 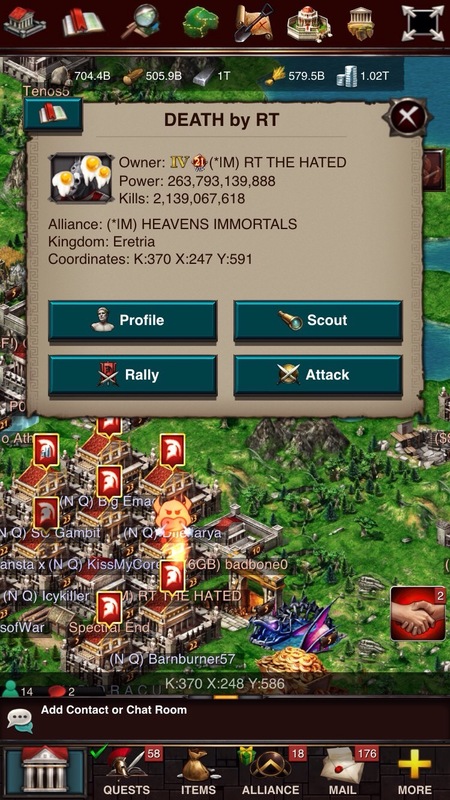 Suddenly they reach 1M Power… At the time of turmoil of ToP only litlle player got T4. And heard those people spend mote then thousand dollar to be there. Only to get less then 10 Million Power. Then i realize MZ sale is massive, way massive than its inception. Play a day, git adv summer sale only 6 dollar…boom i hit 10 Million easily. So those who play first era surely jealous, i guess, on of all sale things nowadays. But for me, im not going to fall to GoW again. It just drain you even with supersale..
What a pointless load of drivel – get a life …:O) honestly guys – is this the best you can do? Shouldn’t your community psychiatric nurse or doctor be looking after you better… :O) There is a big wide world out there full of real people. They won’t hurt you, honestly – go on give it a try :O) I did….. Burn test without using the embassy is silly. Everyone knows that the difference between being hit with reinforcements and no reinforcements is a big difference. Congratulations on spending tens of thousands of dollars to be able to perform this test. It must have taken some serious brains and balls to perform what so many others cannot! Don’t hate because people like to spend money to have some entertainment. I think y’all missed something here. There was no zero. These were core test hits. I did explained about meat, that we were testing, and failed a few times before being able to burn him without meat. However a few corrections. 1. The close hit posted above wasn’t with wonder titles, or anything else. Just boosts, again the target without reinfs or boosts. This is RT. The story leaves out several basic facts 2 of which I’ll post here. First, the 1st hit was a meat hit. I had forgotten about several million misc. 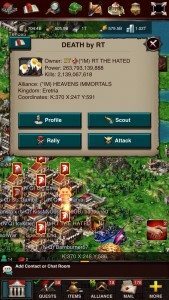 1-3 level troops used to fill wonder rallies. I cleaned them out. He lost by over 500k next hit. 2nd. 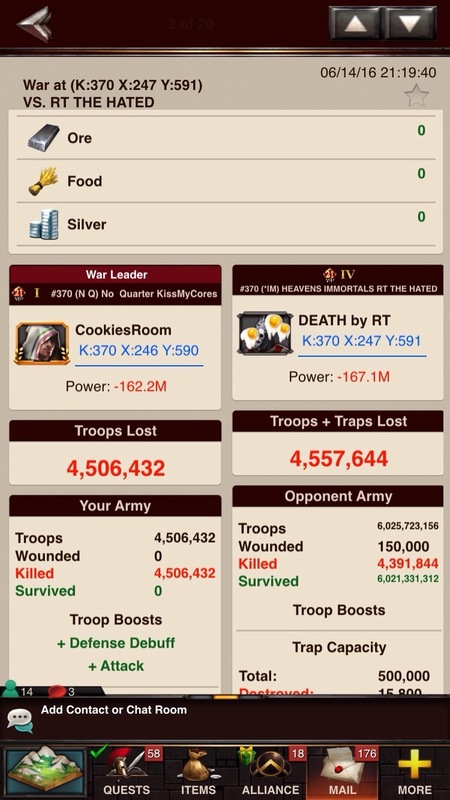 I wasn’t boosted or reinforced with even 1troop during any of the hits. That said, I was definitely surprised that Kiss was able to get that close by changing gems and customizing the pieces. Regardless of my boost status. Attacking to zero is a lack of imagination. No real commander utterly destroys the target. That’s a Pyrrhic victory. You must gain allies and get people to defect to your team — THAT is strategy!